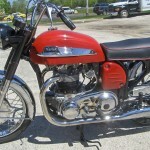 Restored 1967 Norton Atlas Motorcycle. 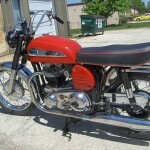 This beautiful Norton was restored over two years. The engine was fitted with new oversize pistons and re-bored. The crank was reground and fitted with new undersized rod bearings and new main bearings. New valve guides were installed. The cylinder head was bead blasted . 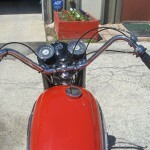 Every fastener was renewed, replaced or polished. Many stainless steel fasteners were used. Every thread was re-cut or re-tapped. Countless hours were spent fine wire brushing and polishing critical surfaces. The magneto was completely rebuilt and fitted with a newly re-wound armature. 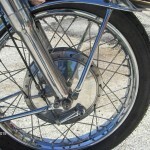 New British chrome rims front and rear were laced with new stainless steel spokes from England. All new control cables were installed. New spark plugs were fitted. A new original OEM petcock was fitted. 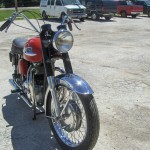 The fenders, primary cover and the passenger hand rails were re-chromed. New steering races and bearings were fitted. A new OEM style exhaust system was installed. 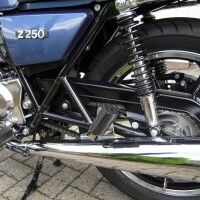 New British rear suspension units were fitted. 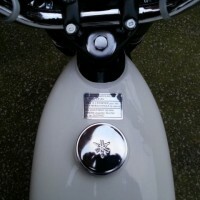 A new headlight rim was fitted. All new foot rubbers were used. New passenger foot rests were installed. New gas and oil caps were added. 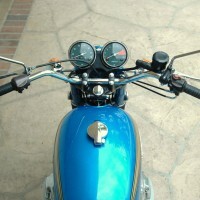 The speedometer and tachometer cables were replaced. The original Amal carburettors were rebuilt. A foam air filter element was installed. The frame was sandblasted clean and professionally painted gloss black. 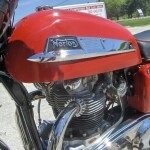 The gas tank, oil tank and the toolbox were professionally painted in Chrysler red. 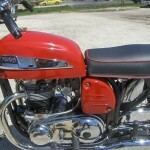 The seat base was rebuilt and fitted with a new original style seat cover with red piping to match the gas tank. 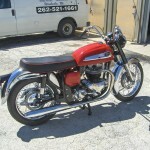 A great restored Norton Atlas Motorcycle. 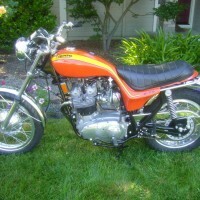 Norton Atlas – 1976 For Sale or Wanted? 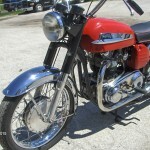 If you're looking for the perfect Norton Atlas – 1976 for sale then take a look at the hundreds of restored classic motorcycles listed on our extensive Motorcycles For Sale pages. 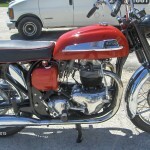 We regularly feature very nice restored Norton Atlas – 1976 bikes for sale. 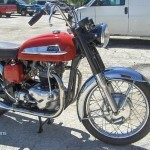 Spares and Parts for your Norton Atlas – 1976? 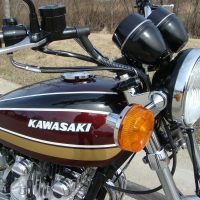 Workshop Manual for your Norton Atlas – 1976?